The name citrine refers to any quartz crystal or cluster that is yellow or orange in color. Ocurrence: Brazil, Uruguay, Mexico, Russia, USA. Although, often cut as a gemstone, citrine is actually somewhat rare in nature. Most citrines on the market have been heat treated. Specimens of low grade inexpensive amethyst or smoky quartz are often cooked at high temperatures to produce the more profitable orange yellow citrine. Citrines with colors produced by artificial means tend to have much more of an orange or reddish caste than those found in nature which are usually a pale yellow. Much of the natural citrine may have started out as amethyst but heat from nearby magmatic bodies may have caused the change to citrine. Interestingly, a popular gemstone on the market is a mixture of half amethyst and half citrine and is given the name ametrine. Unfortunately, citrine is often confused with the more expensive orange-yellow topaz and is at times sold as topaz by unscrupulous dealers. This practice has soured many potential citrine fanciers who see citrine as a fake topaz and not as a legitimate gemstone. Citrine is the abundance stone. Joyous, warm and energizing. Raises self-esteem, stimulates mental focus and aids in the alignment with the higher self. Attracts ad maintains abundance. Citrine really is the stone of joy and plenty which attracts abundance on all levels, and it is useful to have around you in business. The energies of citrine are warm and uplifting and it helps to stimulate mental focus to higher levels. 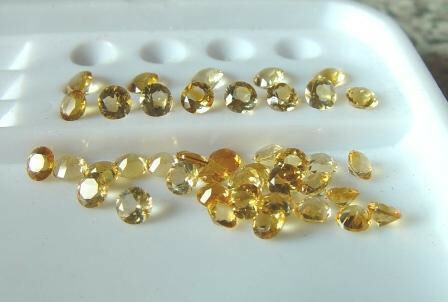 It is one of the most affordable gemstones, thanks to the durability and availability of this golden quartz. Named from the French name for lemon "citron", many citrine have a juicy lemon color. In ancient times, citrine was carried as a protection against snake venom and evil thoughts.